In 1985, although the school district had support from various chambers of commerce, the new superintendent and School Board felt that a more cohesive, county-wide organization was necessary. After thorough research and investigation, a direct-support, private, non-profit organization was formed under Chapter 237.40, Florida Statutes. With the voluntary assistance of an attorney and the School Board attorney, Articles of Incorporation were written and filed March 14, 1985. The original 16-member board of directors included some of the county's most respected business, civic and community leaders working in partnership with the five-member Volusia County School Board. The first meeting of the board took place on March 21, 1985. The school superintendent, school board chairman and school board attorney served as ex-officio members in order to keep close communication with the school district while also maintaining FUTURES' autonomy. The name FUTURES was taken from the term used in the risky commodities market. It suggests that although there is no guarantee of a return on our investment in young people, the promise of future success is great. It is important to note that the future of our nation is increasingly dependent on public support of education. Back in 1985, the FUTURES board adopted a mission statement and goals, divided into subcommittees, and proceeded to raise money to finance its original budget of $27,000 for its projects. The budget for 2018-2019 has increased to more than $700,000. Today, FUTURES Foundation for Volusia County Schools continues to encourage business and civic leaders' involvement in, understanding of, and commitment to public education. Through education and close involvement with the superintendent, School Board and district, individuals can be vocal in their support, not only throughout the community, but in the state, and in Tallahassee. FUTURES provides an avenue through which individuals in the community can focus their efforts as well as provide financial support for recruitment assistance, scholarship opportunities, and leadership training programs which enhance the quality of education in Volusia County Schools. Neither local nor state dollars can be used for certain items like recognition and motivational programs which are meaningful to children and staff members. In fact, these are the very kind of things that business and industry have long recognized improve morale and performance, but which school districts are unable to provide. By sponsoring and attending the Teacher of the Year Celebration, Superintendent's Outstanding Achievement Awards Breakfast or Mini-Grant reception, FUTURES Board of Directors enhance the image of public education in the community and raise the level of self-respect held by teachers and other staff members. Because of FUTURES leadership and support, the community's attitude about our public school system has evolved from one of "benign neglect" in 1985 to one of "committed involvement." FUTURES Board members have brought a feeling of renewed dedication and enthusiasm to public education! While the funds FUTURES raises enables the school district to expand its programs and projects, the true value of this organization is that it demonstrates that civic and business leaders recognize that the economic and cultural future of our county is strongly related to the quality of public schools. As the School Board and superintendent set new directions and implement changes, FUTURES provides strong support in the community which enables the school system to be progressive and innovative. FUTURES provides an avenue for citizens to invest in students and to recognize that all Volusia County residents have a stake in the future of our public school system and the growth and development of our community. 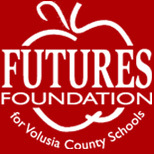 The FUTURES Board has been, and continues to be, committed to reaching for the highest standards of educational excellence and has made public education a top priority as it carries out its mission: "To engage business and civic leaders to promote and achieve educational excellence for Volusia County Schools."